Unión del Barrio stands in solidarity with Los Angeles teachers! Los Angeles teachers are showing District Superintendent Austin Beutner that when it comes down to defending public education, they are not afraid to go on strike. During the past 20 months the LA teacher’s union (UTLA) has been in negotiations with the LA Unified, struggling to improve the conditions in one of the largest districts in the United States. On this first day of the strike, we must not forget the real reason why teachers, students and community members are coming out (despite the rain) to demonstrate support for what has become a popular movement in support of education – something that has not been seen in LA for 30 years. The most significant obstacle in these negotiations has not been a lack of money or the imposition of unreasonable demands, but Austin Beutner’s continued defense of multimillionaire owners of transnational companies and charter schools, who for years have invested millions of dollars and deployed their lackeys like Beutner (and other members of the School Board) who dutifully advance the privatization of everything related to public education in Los Angeles. These educational profiteers are led by a chorus of self-declared “community leaders” who in reality are apologists for capitalist exploitation and shameless advocates of private interests. They shed crocodile tears for “our children” while they applaud the cancerous construction of more charter schools that will fill their pockets with money. Clearly, this is primarily a fight against the privatization of public education, and LA teachers have decided to undertake an arduous struggle in defense of public education and against greedy corporate interests. Superintendent Austin Beutner is a former CEO of the neoliberal newspapers Los Angeles Times and the San Diego Union Tribune and was Antonio Villaraigosa’s former lieutenant. He chose to ignore the just and urgent demands of LA teachers, falsely arguing that there are no funds to support real change. Beutner, basing his arguments on his deep-seated belief that workers exist primarily as a exploitable pool from which to extract profits, maneuvers as if the teachers are not workers worthy of dignified wages. He is a person who hypocritically promotes the idea that the teaching profession is best considered a form of charity, and that teachers should sacrifice themselves “for the good of children.” Moreover, Beutner, and politicians such as Councilman Curren Price and former mayor Antonio Villaraigosa, have tried to convince the public that the teachers should uncritically accept what is given to them, tolerate existing working conditions, sacrifice medical care, and economic well-being in order to prove their dedication to students. When they see that teacher are ready to fight for what is fair, politicians and privatizers paint teachers as selfish people who stand against the interests of children. How will the teacher’s strike in Los Angeles benefit our children? To begin, this strike is not just about opposing privatization, or demanding increased salaries, but it is demanding a reduction in class sizes throughout the Los Angeles Unified School District. Teachers are struggling against pedagogically counterproductive standardized tests that stifle classroom instruction. Teachers are demanding quality educational resources, with an increase in the number of counselors, librarians, nurses, and support staff. Instead of providing these essential services for student development, school profiteers have contributed to the criminalization and imprisonment of our youth, and that should no longer be tolerated. Painting public school teachers as enemies of education is a tactic we have seen used in other states and countries where the educators demonstrate resistance to privatization. As in Los Angeles, in Chicago, Oaxaca, and Puerto Rico teachers challenge investment bankers who seek to draw profits from public education. There are powerful interests who work daily in order to dismantle public education through the imposition of standardized tests, the transformation of students into servants of the capitalist system, attacks against teachers to use them scapegoats for educational problems, and drawing away of public funds from public schools into pockets of private investors. Why is there so much interest in our educational system? Apart from the money that can be drawn away from this system (and there are many who seek to take a bite), there is the capitalist economic system that prefers that schools remain an instrument of neoliberal globalization. In their ideal schools, students are only tools that should help support capitalism, and never allow educational systems to challenge social, economic and political inequalities. They only support educational systems that reinforce the power of the rich, and reproduce the systemic exploitation of the workers. We reiterate that this strike is a form of popular resistance in defense of public education. It is a struggle against those who do not care about the future of our communities. If we want to see real gains within the context of student learning, we must invest in our public schools above private interests. It is our fundamental responsibility to resist together with our teachers, students and parents. This fight against the privatizers will only be won if we stay united. It’s time to resist the billionaire privatizers! We will defend our public schools at all costs! 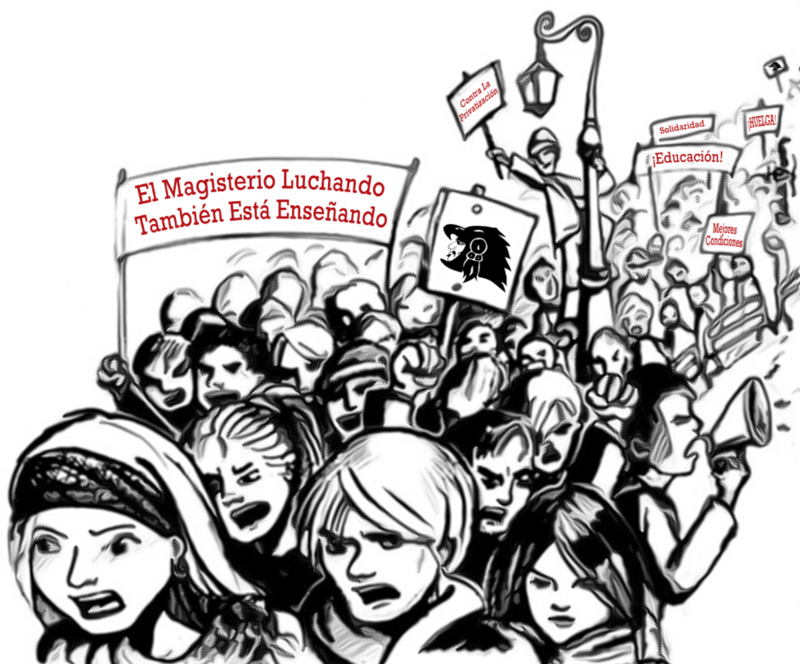 Let’s not forget: ¡El Magisterio Luchando, También Está Enseñando! This entry was posted in 2019, Analysis, Barrio Youth News & Events, En Español, Event, History, History, K-12 News & Events, Labor News & Events, Local Community News & Events, Los Angeles News & Events, Neoliberalism, Organizational Updates, Solidarity, Statement. Bookmark the permalink.